I haven't had the chance to ride around Forest for quite a few years so, with Norm and Jess Douglas putting on a race with a distance I am suited to, I jumped at the chance. Knowing that there was 6000vm and 300km to be covered I did some last minute cram training with a 17hr Everesting session the weekend before! With Shane Roberts as my partner for a 2 man race I was quite confident we would finish the race in a respectful time. Shane has raced to a high level in several 24hr events and has had further success in the Victorian 6hr series. Shane was also my pickup from the airport which occurred at 9.30 pm Friday night. With a 2hr drive to Forest for the race I was well and truly asleep by 1am after building my bike and getting bottles etc sorted for the following day. Day 1 - 178km started at 7.15am as a light rain began to fall and most riders started in their compulsory rain jackets. The shivering on the start line didn't last long as the course soon headed upwards. At the first feed zone I was with another 3 teams. The group I was with made the most of the amazing feed zones and allowed the chasing group to catch back on. The typical feed zones were separated by 20-30km and had bags or bottles that could have been dropped at the start of the day. Even though most riders have their own products it seemed everyone felt compelled to try the various fruit, buns, sandwiches, bars, gels, lollies, pastries etc that were on offer. I'm pretty sure I wasn't quite burning off the amount of energy I was consuming! During this same stage, there were times when a few teams would get off the front for a small period of time. After 50km there were still 8 or 9 teams riding together. Just before Apollo Bay one team managed to get a small gap however, with a few gun roadies in the mix a little bit of swapping turns at 45km/hr soon kept the group together. Just out from Apollo Bay I stopped to reattach a cleat and spent the next 30km with Shane riding harder than we wanted to catch back to the group. After having fun riding with a well paced group the fun stopped. At the 110km mark the boys started to wind up the pace on the climbs. I was getting a little bit excited and ready to race, but Shane wasn't up for matching it on the climbs so we had to watch the first 3 teams ride away. 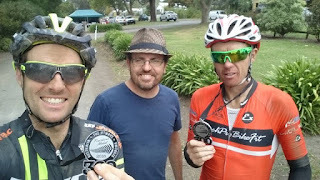 Once the gradient changed and we hit the rail trails I sat on the front and tried to keep the pace on, even with gates and going off course we averaged around 35km/hr before catching the 2nd and 3rd placed teams. We rode together back through Forest before the last climb split the 3 of us. Sitting in 4th with around 20km to go I turned the pace up on all the flats and downhills and we managed to eventually get a gap and hold onto 3rd place and gain a 4 minute buffer through the final 5km of single track before the last rail trail home. Coming across the line I was pretty stoked with the sense of achievement from completing the day's ride. It was such an adventure to be riding at such a good pace being surrounded by quality riders and getting to check out a wide variety of trails. It was interesting to see the different riders abilities come out to play at different stages during this stage. Once I was told to move away from the finish line feed zone, Shane I headed straight to the Corner Store Cafe for a MTB Surprise Milkshake. These things are great and I highly recommend! Day 2 started at 6.15am. The morning once again was quite chilly and I opted to start in the rain jacket again. It was much sooner during this stage that I took the jacket off as the climbing started early and there was no rain this time. There were sections of track that I'm sure I had ridden before as part of Otway marathons however, I generally wasn't sure what to expect. One of the things I learned early on was it was far more fun on the front downhill. The amount of dust that we were generating was at times crazy. There were occasions where I almost had to come to a complete stop to wait for the dust to clear when descending. This stage had quite a few really fun downhills. I am glad I packed the Mach 429SL as with the dually I could just let it go and enjoy the speed. At the 45km feed I made an effort to ride ahead of Shane to try and get him a bottle and get on the way ASAP. The plan was to gain a 20 second advantage where we could just take it easy for a couple of minutes until the boys caught up. This seemed to work OK from my perspective and we got a small rest window however, it seemed to upset at least one of the elite riders who couldn't find his bottle as quickly. He made me feel so bad I had the plan to ride ahead of him at the next feed, find his bottle and pass it to him. I don't plan on upsetting people when I race, I was just trying to buy some more time that we could stay with the top few guys. The next hill was the last time I saw top 3 teams. I wasn't really noticing the hill at the 55km mark however, Shane and a couple of other teams were. A group of 6 of us reached the top of the last significant climb at the 74km mark and we swapped turns until the last single track to try and achieve a good race time. Riding through the last single track we started to concede some more time to the group that we were with and with a final rail trail and hill sprint we managed to finish in 5th place for the day. Far enough behind the other riders that we moved back into 4th overall. Day 2 ended up being closer to 110km which was significantly shorter. While it didn't have the ocean views it had some really fun downhill fire trails. The 2 man team event is a new thing for me. I haven't done anything like it before. It is a great way to share some memories but I can image some frustration occurring between unequally matched riders who have performance goals. I can highly recommend this event to anyone that wants a good challenge. It's not a technically demanding race as there was barely any single track. While there are some steepish descents, they are mostly fire road and can be ridden slowly. With the amazing feed zones and the option to have bag drops the logistics are really taken care of to ensure all riders have the opportunity to finish. Next year when I head back, it will either be with someone that is going to rip my legs off each day and provide me with a serious training weekend or I will pair up with my wife to just enjoy the journey. Either way, this event is such an adventure I would really like to come back again. Thanks Norm and Jess for putting on such a great event. I really appreciate the opportunity to attend this event.